Who were the Marks Brothers? Who were the Canadian Kings of Repertoire? 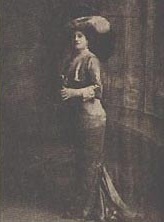 Gracie Marks, wife of Joe, and star of the Marks No. 3 Company. Below: May Belle Marks, wife of R.W. and star of No. 1 Company. ﻿﻿From the 1870s into the 1920s, Perth, Ontario’s Marks Brothers Dramatic Company toured much of North America. The “Canadian Kings of Repertoire” were one of the most successful companies in early Canadian theatre, in fact, in ALL of Canadian theatre, playing to more than 8 million people all told. In 1950, they were selected by MacLean's magazine as Canada's "Entertainers of the half- century." 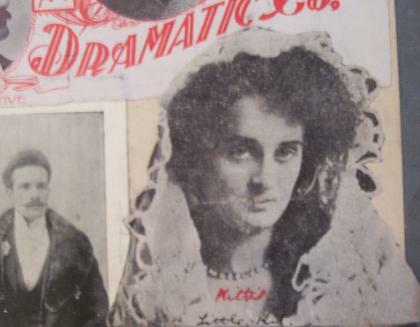 The Perth Museum has an archive of some 27 of their plays, a unique collection and, for the past several years, we have been working to adapt them and bring them back to the stage. They have proven to be exciting and entertaining theatre. And, by the way, the Markses were actually from Christie Lake, 8 miles up the track from Perth. 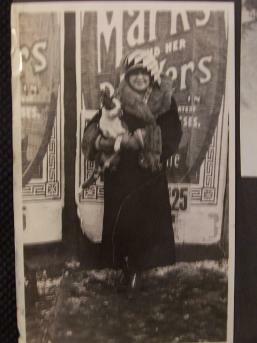 Right, Arlie Marks, with Buster, as Peg, in Peg O' My Heart, circa 1915. Arlie was Tom's daughter and the second generation of performing Markses. Buster is one of Tom's long line of performing canines. Compare this shot with the seated girl in our poster for The Tyranny of Tears, which is actually the artwork for the original poster for Peg O' My Heart. Kittie Marks, Ernie's wife, star of the Marks No. 4 Company. Ernie inset. Robert (R. W.), Thomas (Tom), Joseph (Joe), Ernest (Ernie), John, MacIntyre (Mac), and Alexander (Alec). The story goes that in 1878, King Kennedy, a magician, was playing to a small crowd in Maberly, Ontario. Afterward, a brash young man offered to take over Kennedy's management, for a percentage on every ticket he sold above the dismal crowd in Maberly. Robert Marks's career as a theatre entrepreneur was born. Within two years, he had purchased the Emma Wells stock company, was joined by brothers Tom, Joe and Ernie and the Marks Brothers Dramatic Company was created. By 1890, the Markses were sending four companies out from their homebase in Christie Lake each year, playing every small town from Ontario, west to B.C. and into the northern U.S. With their wives Kittie, May Belle and Gracie as stars (Tom was a star in his own right), they toured for more than forty years. When a Marks company first came to Winnipeg, the newspaper announced "Hurrah! The Marks Brothers are here. We're not a backwater anymore!" They were famous for their elegance (top hats and diamond signet rings), their vast repertoire (we have identified over 100 shows they performed), their family-oriented entertainments and, above all, their showmanship. 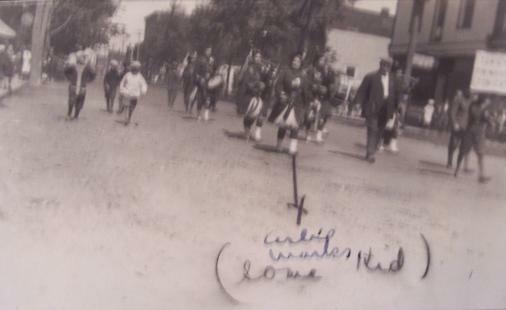 The Tom Marks Kiltie Band arrives in town, with Arlie Marks leading the way and Tom beside her. Proud Auntie Gracie (childless herself) has notated "Some kid" under Arlie's name. The Kilties survived into the 1990s in Arnprior, Ontario. Below is a link to a database of the Marks's playlist over the years. Alec, Mac and John eventually went into mining in B.C., but the remaining brothers stayed in show business. R.W. and Tom became the elder statesmen of Canadian theatre in the 1920s and 30s. 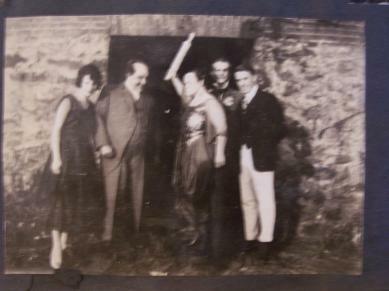 Joe was one of the first promoters of cinema in Canada, being the first to show such films as The Great Train Robbery, between acts of the touring shows. He continued to promote events until his death in the 1940s. Ernie was a long-time mayor of Oshawa, Ontario, where he operated the Marks Theatre movie-house, which still bears his name. The last of the brothers, he died in 1952. The last of the performing Marks, R. W.'s son Robert Jr., who was a stage veteran at the age of three, passed away in the early 1980s, leaving his collection of Marks memorabilia to the Perth Museum. Additionally, the Jacklins have in their possession Gracie Marks's personal memorabilia, including photos, reviews and much more. A staged promo shot for the Marks's production of Bringing Up Father, with Tom as Jiggs and Gracie as Martha. 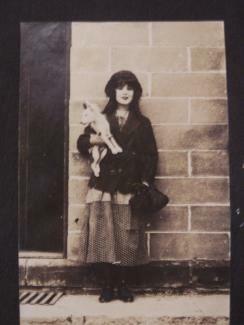 From the woman's skirt length at left and the men's sport coats, this is from the 1920s.